Over the past few months there have been multiple birthdays here at BBS. Kids going from child to…well, older child. Here are our lucky rascals: Ilya, Makiha, Emma, Sawyer and Audrie. They have all celebrated and had fun. Sadly, most of them celebrated without the rest of us students. What a bummer! We are so fun! One of the birthday girls, Audrie, brought in lovely cookies. We sang an amazingly off key “Happy Birthday,” though she seemed to like it. Then we ate our beautiful pink and white cookies. I have to say, they were pretty good. It was very fun. On another note, I am doing a project involving birthdays, it is an astrological project, where I find out what zodiac signs the other kids are and study them. So far, I have figured out that there are two Capricorns, one Aries, two Gemini, three Cancers, three Leos, one Virgo, one Sagittarius and two Aquarians. That’s a lot of diversity sign-wise. Astrology is the study of the zodiac signs according to the stars and planets. The zodiac signs are separated into four categories, earth, water, fire and air. At BBS there are mostly fire and air signs and some water and earth signs. BBS has had many student birthdays and has more to come! I will keep on working on my birthday project to learn some more about the kids' signs, and write about it again. All in all, this year students will be going from little kids to big kids and from big kids to TEENAGERS!! Wow, what a change. February is one of my favorite months because the Science Fair happens in Sisters. Black Butte School students will participate in two ways. Students are making mousetrap cars to enter the Design Construct Compete Challenge. We are also making a poster board display on our snowpack studies. We are working on our mousetrap cars as part of math. The challenge is to build a car that moves and stops using only mousetrap power. In each round of the competition the cars must travel a given distance and stop in a designated area. For an added challenge this year, advanced rounds will include an obstacle that cars must be able to turn around. We are using Victor wooden snap-type mousetraps, CDs, records, soda cans, string, rubber bands and other materials to construct the cars. My car has two record wheels with an axle, the mousetrap hangs in the middle, and a string attaches to the metal hammer and the axle to give it power. For our school display we’ve been gathering snowpack data since after winter break in the school yard. We have also used websites to get data for every Wednesday starting November 25, 2015 in other locations in the Cascades. Our display will show snow depth, snow water equivalent, precipitation accumulation, and air temperature for sites around Oregon. Students will be available to explain this information to visitors. We hope you’ll join us at the Science Fair on at noon on February 20th at Sisters High School. It’s going to be a fun day. Black Butte School has taken ANOTHER field trip. This time we went to the wonderful and beautiful Whychus Creek. Our teacher for the day was a nice lady named Kelly who works for the Upper Deschutes Watershed Council. The students sat and listened to all the damage that the creek has gone through and what we can do to help. We enjoyed the wilderness as we watched many fish and possibly water skippers pass by. Many smiles were seen that day as the children's eyes lit up with joy. Mud was splattered around as the students experimented by making our own little rivers. We got to observe how water likes to maneuver on it’s own and what flash floods do to the ecosystem. We returned to Whychus Creek for another field trip a couple weeks later to learn more. We are also studying the Metolius River and comparing the health of the river and the creek. At BBS we have many classes, one of them is Humanities. In Humanities class lately, upper grades students (grades 5-7) have been learning about Reconstruction from a book called A History Of US,(sort of a play on words), By Joy Hakim. We just started learning about the Industrial Revolution from the same book. We also have many handouts and worksheets about things we learned about. 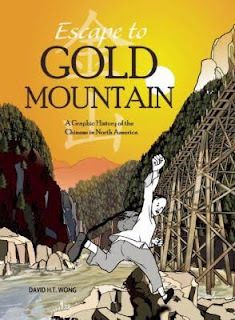 To help us broaden our perspective and connect history with literature, we read books and graphic novels about history. One we read is about Chinese people in America, called Escape to Gold Mountain by David H.T Wong. It may be a little violent but is very educational. We are planning to read another graphic novel called Maus by Art Spiegelman, which is about World War I and II from a Mouse's perspective. We also focus on grammar and creative writing skills in Humanities, using the curriculum Seeing Stars. Seeing Stars teaches us about syllables, vocabulary, and how to write stories. The lessons give us nonwords and words to practice syllable breaking and a prompt to write a story. Overall Humanities class is pretty fun, and we learn a lot too. Guitar class is pretty awesome! We started it on January 19 and will be ending it on March 17, Saint Patrick’s Day. The teacher, Benji Nagel, is a 27 year old guitarist. He has been involved with the Sisters Folk Festival for about 12 years and is really good at what he does! He and his wife have a beautiful garden in Sisters that is just amazing, called Mahonia Gardens. Those were some fun facts about Benji now here are some about class. In guitar class, so far, we learned some basic chords and the different notes that the different strings play. The chords are pretty easy to do, but if you want to make a sound you have to press your fingers down really hard! “It hurt my fingers,” said one of the third graders. At first I had a hard time getting my fingers in the right places, but since I’m a pianist my fingers are strong so I kind of got the hang of it. To play guitar you should have very strong fingers or it will be pretty hard. All in all, guitar class is great and we have a great teacher! I hope that everybody else think so, too.